Hays County well owners thought they won the water fight against Houston-based Electro Purification three years ago. Now, regulators are left trying to balance residential priorities with business interests. Hays County residents thought their water was saved. Houston-based Electro Purification had plans to pump 5.3 million gallons of water per day from the Trinity Aquifer. The area wasn't regulated by any groundwater conservation district, meaning the water was considered the company's private property and it could pump as much as it pleased, even if it meant running neighbors' wells dry. A 2015 law changed that, annexing the company's leased parcels of land into the control of the Barton Springs/Edwards Aquifer Conservation District. Any pumping would need a permit from the district. Residents assumed the fight was over. But now the district stands poised to grant Electro Purification, also known as EP, a permit to pump up to 2.5 million gallons of water daily. Residents are left wondering if their legislative fight was all for nothing and if their wells are still at risk of running dry. As the permit awaits approval from the district's board, the residents who formed the grassroots group Save Our Wells three years ago are once again springing to action. Yard signs denouncing the project dot properties throughout the county. 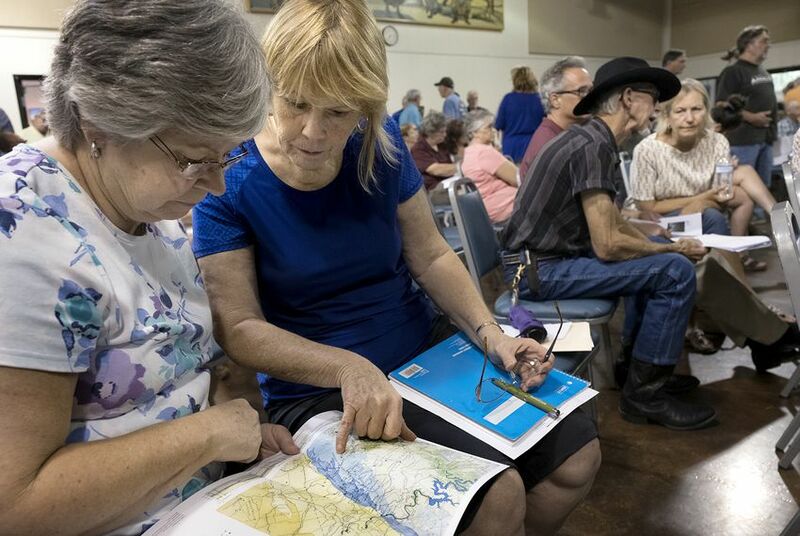 On June 18, concerned residents crammed into the Wimberley Community Center, turning an informational session reviewing the dry details of a water production permit into a standing-room-only event. Electro Purification has seven wells built on property leased from two local landowners. Should the permit be approved, the water would travel by pipeline to neighborhoods and businesses serviced by the Goforth Special Utility District, satisfying a contract between the two. Under state water law, this counts as beneficial use, even if Hays County residents might not agree. Similar arguments between residents and big businesses have become a common refrain throughout the state as water supplies continue to shrink and the population continues to grow. And given the patchwork nature of Texas water laws, groundwater conservation districts find themselves stuck in the middle, attempting to juggle conservation efforts with landowners' rights to develop the groundwater under their feet. Through science — 15 years of research on the Trinity Aquifer, to be exact — the district thinks it’s crafted a permit that both satisfies Electro Purification’s rights to water development and protects residential wells. Less than half of the originally requested 5.3 million gallons per day are now up for grabs, and the permit would require pumping volumes to be phased in over time, beginning with 500,000 gallons per day. EP could request to increase pumping volumes every nine months, so long as the company has taken the proper steps to adequately safeguard water levels. Along the way, the district plans to closely monitor the wells — if water levels drop to a certain level, EP’s pumping would be scaled back or come to a halt, Brian Smith, the district’s aquifer science team leader, said. EP would also be required to lower the well pumps for any resident within a two mile radius of the well field who believes drawdown levels would affect their well. That’s where residents are confused: The Trinity Aquifer is divided into three levels, and each level will see different drawdowns. What’s more, Smith said, most people don’t know what level their well falls into. The district believes holding EP responsible for residential wells, combined with carefully evaluating impact to the aquifer before advancing to a higher-volume pumping stage, should mitigate any negative effect, Smith said. But regardless of precautions taken by the district, opponents “don’t believe it protects the long-term sustainability of the aquifer and property rights of the landowners,” said Vanessa Puig-Williams, executive director of the Trinity Edwards Springs Protection Association. In fact, opponents believe phased pumping shouldn’t have been recommended in the first place. Why not issue a permit for 500,000 gallons a day and make EP apply for a new permit if they wished to pump more, Puig-Williams asked. Throughout the state, she said, groundwater conservation districts “are terrified of getting sued by applicants” for takings claims — or when landowners claim groundwater regulation results in a violation of property rights. “We’re going to be sued one way or the other,” Bill Dugat, attorney for the district, said at last week’s public meeting, whether it’s by EP for a denied permit or those against the wells for granting the permit. The permit has already been challenged by the Trinity Edwards Springs Protection Association. Puig-Williams said over 100 landowners have already signed on in support. Correction: A previous version of this story incorrectly described Goforth. It is a special utility district.